Creta Cargo Line’s 4,163gt/1968 built Nearchos ran aground on the volcanic islet of Nea Kameni in Santorini’s caldera on 27th October whilst bound for Thira (Santorini) from Mykonos. The ship was carrying 5 HGV tankers and their drivers, the latter being safely transferred ashore, plus 13 crew members. The ferry appeared to have sustained considerable damage and the mysterious cause of the incident is under investigation but she was clearly way off course. The 87m long Nearchos was built as the Christian IV and has also carried the names Safari, Lobo Marinho, Lobo Dos Mares and Menhir. She was converted to a Ro-Ro ship in 2016 with capacity for 15 drivers, 25 HGVs and 20 cars. What the future now holds for this Danish built classic remains to be seen. MBNA Thames Clippers took the latest step in its incredible success story on 31st October by revealing its 19th vessel to invited members of the media at Wight Shipyard, East Cowes, I.o.Wight. The name of the 222-seater Hunt Class catamaran will be Venus Clipper. The vessel is 2.5m longer than the other 4 Hunt Class ferries, the last 2 of which were built by Wight Shipyard (Mercury Clipper & Jupiter Clipper). Grandi Navi Veloci’s 39,777gt/1998 built RoPax vessel Excellent crashed into a container gantry crane at the port of Barcelona on 31st October as she arrived from Genoa (above). The collision caused the crane to topple over backwards, the impact of which sparked a fire on the dockside as it fell onto containers, 7 of which contained dangerous goods. The ship was attempting to berth in adverse weather and somehow contacted the quayside and subsequently the crane. She was carrying a total of 414 passengers, 59 of which were destined for Barcelona. Remaining passengers were transferred to another ship for onward travel to Tangier. A full investigation followed but the ship appeared to be largely undamaged. As is the way nowadays, the entire incident was caught on camera/video from multiple angles and published all over the internet. GNV’s 40,193gt/1999 built Excelsior took over the Excellent’s service with the latter arriving at Palumbo shipyard, Messina, on 6th November for repairs. Italy’s Mediterraneran coast was battered by storms towards the end of October with several other incidents occurring besides this one. They included Corsica Ferries’ 3,530gt/1996 built Corsica Express Three and Tirrenia’s 31,041gt/2000 built Raffaele Rubattino both breaking free of their moorings in Vado Ligure and Naples respectively during gale force winds and storms on 29th October. Delcomar’s 2,121gt/1983 built GB Conte (the former Sealink/Wightlink ferry St. Catherine) received hull damage above the waterline as she attempted to depart Carloforte, Sardinia, in high winds upon bound for Portovesme on 29th October when blown into the quayside. Sistership, the 2,121gt/1983 built Anna Mur (the former St. Helen of Sealink/Wightlink) was off service for refit at the time. Around this time Grimaldi Lines’ 30,902gt/2002 built Cruise Ausonia suffered an engine room fire while sailing from Ustica to Livorno on 27th October. There were 262 passengers and 85 crewmembers aboard and, with one engine still running, the ship limped into Palermo at 6 knots. The fire was extinguished and there were no injuries. Many media outlets failed to do their homework and described the former Superfast XII as a cruise ship, presumably as her name is Cruise Ausonia! Fred. 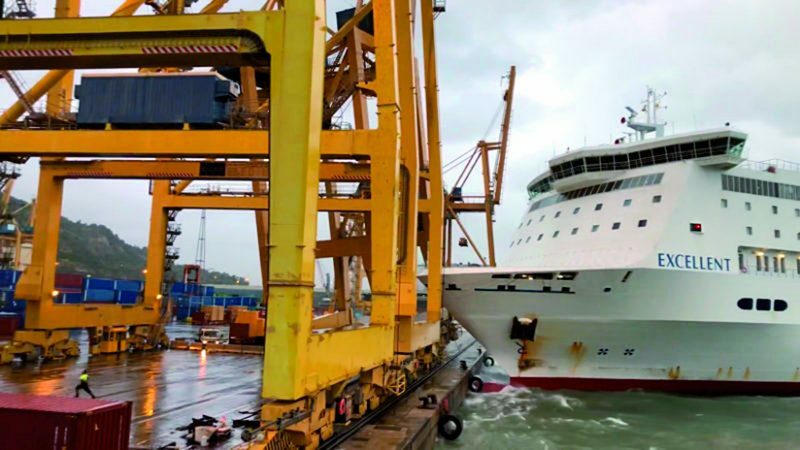 Olsen Express and Baleària began the new route between the Canary Islands and Huelva on 11th November through the joint venture of Canary Bridge Seaways (CBS). There are three weekly rotations with two ships to guarantee a reliable service. The route will be triangular between the ports of Huelva, La Luz in Las Palmas de Gran Canaria and Santa Cruz de Tenerife. Departures from Huelva are on Tuesdays, Fridays and Sundays at 2000 and from the Canary Islands on Tuesdays, Thursdays and Sundays at 1200.